Proper IT infrastructure management and maintenance is important. This allows you to guarantee the health, status, and security of your IT infrastructure. MSPs are IT management firms that can best provide you with network management and monitoring services fit for your needs. They assure that their services will remain available throughout the day. This is important for every business, especially for those that operate 24/7. Network issues are unpredictable. They can disrupt your infrastructure at any time. But with a reliable IT team that constantly manages your systems, you can ensure to maintain network stability. Through 24/7 IT monitoring services, your provider ensures that your network remains up and running. It will guarantee that all updates, patches, and configurations are installed in a timely manner. The main value proposition of an MSP is its high-quality IT services. MSPs achieve this through using up-to-date IT systems management equipment and solutions. By using only best-in-class technologies, MSPs assure that they can deliver top-notch services to their clients. MSPs also hire the best IT experts possible for the job. A reliable MSP implements in-depth hiring processes. This enables them to identify the best tech specialists and IT engineers for the job. With top-notch IT teams, MSPs assure that they will manage your IT infrastructure the best way possible. Network management and monitoring is a must for every business. However, it will cause you to spend huge chunks of your overall company budget. 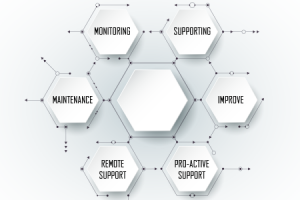 The best way to control your IT costs is through outsourcing network management and monitoring. An MSP will provide you with all the necessary network management equipment that you will need. And because qualified IT experts will watch over your systems, you don’t need to hire internal IT systems management specialists anymore. This will significantly cut down your labor wage expenses. You can get all these IT services in exchange for a predictable and recurring service fee. You also have the option to customize the services you will get. This allows you to identify the exact IT services that your IT infrastructure needs. With this, you can budget your IT costs effectively. Your systems store bunch critical business data. These include corporate files, sensitive information, business transactions, and other business-related documents. All these business data needs to be protected. Through the help of an MSP, you can set up effective security strategies to strengthen your IT protection. Qualified IT specialists will assess your infrastructure. This allows them to determine the best security protocols and methods to implement. This way, your MSP can provide you with security services that fit your IT needs. With this, you can ensure that all your endpoints and data remain secure at all times. Security breaches can slow down business productivity. Even though you have a strong IT security, you still need to plan out a proactive way in dealing with IT disasters. That way, you can guarantee to maintain business continuity. Your MSP will set up an IT disaster recovery plan. This basically means that they will back up all your files across secure cloud-based databases. When an IT disaster happens, you are guaranteed that your backup data remains safe and protected. This allows you to eliminate the risks of massive data loss. Your provider can retrieve all your data back to your systems. With that, your business operations can remain stable. ➢ When you want to ensure optimal network management and monitoring, you must hire an MSP. They will be in charge in keeping your IT environment safe and healthy. ➢ The services of an MSP can bring a lot of advantages for your business. It allows you to have high-quality managed services that are available 24/7. If you are looking for an MSP services New Orleans-based businesses can rely on, then check out thinkIT Solutions. As a full-service IT management firm, think IT Solutions aims to deliver strategic solutions to solve all your IT challenges. Contact thinkIT Solutions today at +1 (504) 455-5552!